Titled and signed in ink by artist, ‘“SUN, FOG AND ICE / SMITH 3865SOUND” / LAWREN HARRIS / 25 SEVERN ST. / TORONTO’ (verso: top stretcher bar); Written in ink on printed label of Department of Graphic Arts by Doris Mills, ’Sun, fog and Ice, Smith Sound 40 x 50 / Lawren Harris / Arctic Paintings IV’ and in graphite in an unknown hand, `VAULT’ (verso, upper left); Torn printed label, ‘MONTR…OF FINE ARTS’ (verso, upper left corner); Written in ink on a torn label, ‘750’ (verso, top centre); Stamped, ‘WALTER KLINKHOFF GALLERY / 1200 SHERBROOKE ST. W. MONTREAL’ (verso, top centre); Marked in white chalk ‘72’ (verso, upper centre cross bar); Inscribed in ink, ‘ROLANDE DUMAIS, ARCHITECTE, MONTREAL’ (verso, upper right stretcher bar). Artist; Fine Art Galleries T. Eaton Co. College Street, Toronto, 1953; Private collection, Toronto; Roland Dumais, Montreal; Christie’s in Canada, 14 Oct. 1971, lot 72, Montreal; Galerie Walter Klinkhoff, Montreal; Private collection, Montreal. - Artiste; Fine Art Galleries T. Eaton Co. College Street, Toronto, 1953; Collection privée, Toronto; Roland Dumais, Montréal; Christie’s in Canada, 14 Oct. 1971, lot 72, Montréal; Galerie Walter Klinkhoff, Montréal; Collection privée, Montréal. In spite of the difficulties, the trip was very productive and Harris exhibited thirty Arctic sketches in a joint exhibition with Jackson at the National Gallery in December 1930. (Thirty-eight Arctic sketches were inventoried in 1936). 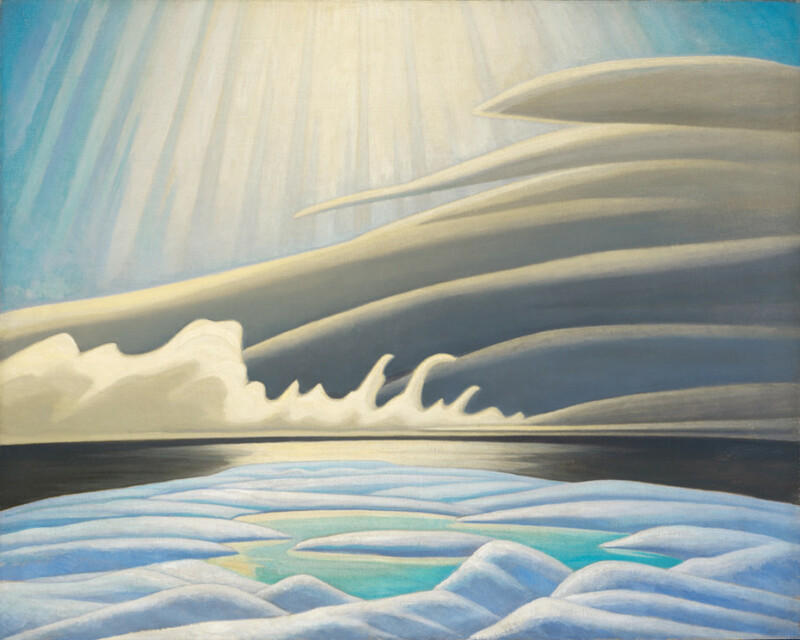 By the time they showed their Arctic work at the Art Gallery of Toronto in May 1931 Harris had already painted six canvases, including Sun, Fog and Ice, Smith Sound. The subjects of Harris’ Arctic canvases include floating icebergs or coastlines and mountains viewed from off shore. The effects of colour and light range from drab browns and greys to blues and off whites, to evocative studies of the effects of sun and ice as in this canvas painted from a sketch acquired by his friend, the Toronto collector Charles S. Band (fig. 1). Harris remained faithful to the sketch in working up the canvas. The ice and pool of water in the foreground, the open sea beyond, the dramatic movement of the fog rising from the water, the almost three-dimensional pointed clouds moving in from the right and the spotlight effect of sun rays emerging from the sky appear in both. But he has enlarged the height to confirm to the proportions of the canvas and thereby increasing the illumination in what must be the most lyrical and animated of all Harris’ Arctic paintings. When exhibited in the December 1931 Group of Seven exhibition, E.W. Harrold wrote in the Ottawa Citizen, “The most striking work is still being done by Lawren Harris. Seven years ago, Harris startled the art world with his ‘Above Lake Superior.’ In this Harris threw tradition to the wind. He did not paint a specific stretch of country so much as a summing up of a whole region… Marvellous light effects are obtained in … “Sun, Fog and Ice, Smith Sound.” This picture mocks all our preconceptions of Arctic scenery. Here is no drab desolation but lights and surfaces that play against each other in the most enlivening way. The conception is vastly original. Again this is not a locality, but the sum of locality.” In 1953 this painting was acquired by the couple who had purchased Lawren Harris’ house at 2 Ava Crescent, designed in 1931 by Alexandra Biriukova. The canvas would have been a remarkable complement to the restrained yet lush severity of the house’s Art Deco interior. Charles C. Hill, C.M.